Product prices and availability are accurate as of 2019-04-20 12:13:01 UTC and are subject to change. Any price and availability information displayed on http://www.amazon.com/ at the time of purchase will apply to the purchase of this product. Features. 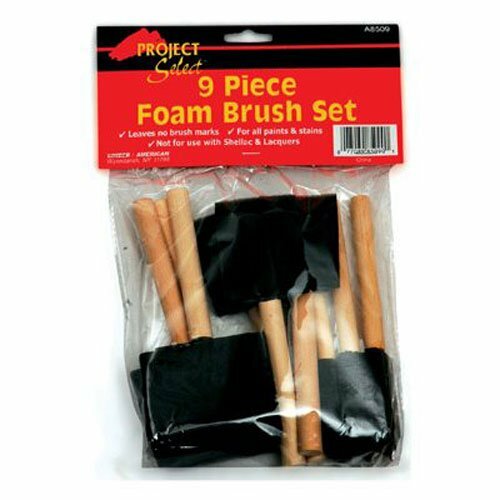 Foam Brush Set.. 9 Piece.. High Density Closed Cell Foam.. Wood Peg Handle.. Leaves No Brush Marks.. For All Paints Stains.. Not For Use With Shellac Lacquers.. Dimension - 12 x 7.5 x 1.75 in.. Item Weight - 0.3 lbs. Three sizes, 9 total brushes. 3-each of the 3-Inch, 3-each of the 2-Inch and 3 each of the 1-inch brushes. High density closed cell foam brush. Wood Peg Handle. Good with all paints. Works great on smooth surfaces.